United Nations withdraws 108 Nigerian peace-keeping police officers in Liberia after 5 years – Royal Times of Nigeria. 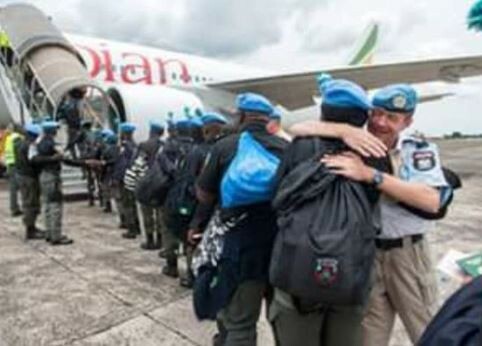 The last batch of 108 Nigerian police officers has been withdrawn from the UN Mission in Liberia (UNMIL) after five years of service. UNMIL said the remaining 108 Nigerian FPU officers, the last UNMIL uniformed contingent remaining in Liberia, withdrew as part of the UN mission’s termination. The mission said,”The batch of 200 Nigerian peacekeepers withdrew from Liberia in February as part of the termination of the mission’s mandate, scheduled on March 30. “The Nigerian contingent has been deployed in Liberia since UNMIL was first established in 2003. Nigeria has been a main contributor of military and police to UNMIL. “The United Nations Mission in Liberia (UNMIL) has been a steadfast partner to Liberia for the last 15 years. It has supported security and security sector reform, rule of law, efforts to disarm, human rights and sustainable peace. The Mission will complete its mandate on 30 March 2018. UNMIL was established in September 2003 with 16,475 uniformed personnel to monitor a ceasefire agreement in Liberia, following the conclusion of the Second Liberian Civil War”. An official farewell ceremony was held in February in honour of the last departing 689 uniformed personnel 404 military and 285 police personnel who had served with the Mission. This symbolised the end of UNMIL’s military and police operations in Liberia, more than 14 years after UNMIL was deployed in compliance with Security Council resolution 1509 (2003). The Special Representative of the UN Secretary-General, Farid Zarif, had in his speech, stated that the farewell signified an important benchmark in the history of the UN in West Africa. Liberian President George Weah commended UNMIL for its longstanding support to peace and stability, saying the Liberian people will forever remain grateful to them for their bravery and service. Weah said, “Thank you for your hard work and sacrifice you have made over the years to keep the peace and stability of our beloved mama Liberia. As you leave us now, we will forever remember you”.